Hardcover, 8.75 x 10.25 in. / 88 pgs / 67 color / 3 bw. 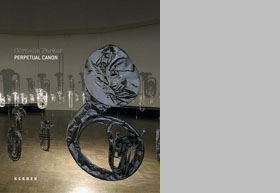 In 1995 Cornelia Parker put actress Tilda Swinton in a vitrine, sleeping on display at London's Serpentine Gallery. (Unlike Damien Hirst's lamb under glass there, the artist had the subject's full cooperation.) Parker's brand of conceptual art takes iconic and historically powerful objects, such as a feather from Freud's pillow or soil removed from under the Leaning Tower of Pisa to prevent its collapse, and transforms it into art that both resonates with that power and becomes something new--and often beautiful. In the case of the Pisa dirt, the suspended clumps, exposed to air for the first time in 800 years, float as if released from gravity. 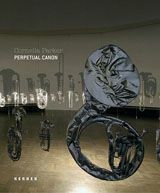 Perpetual Canon features Parker's installation in the historic cupola hall of the Wrttembergischer Kunstverein art center in Stuttgart, along with a number of her works on paper. In this collection, the artist again and again unearths the subconscious within the familiar and the clichª, causing us to see them anew. Whether drawing out a filament from dental-filling gold or splitting objects with the same guillotine used to decapitate Marie Antoinette, Parker constantly challenges what we know and what we think we know. FORMAT: Hardcover, 8.75 x 10.25 in. / 88 pgs / 67 color / 3 b&w.